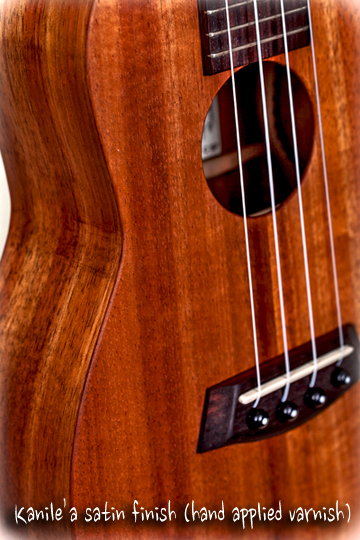 Kanile’a ukulele previously offered two finishes, satin or gloss. We often refer to their gloss finish as a UV finish. Conveniently misused term, UV isn’t a type of finish. It’s a method of curing finish. With powerful UV lights the lacquer dries within seconds rather than hours, days, and much longer like traditional nitrocellulose lacquer finish take to fully cure and gas off. 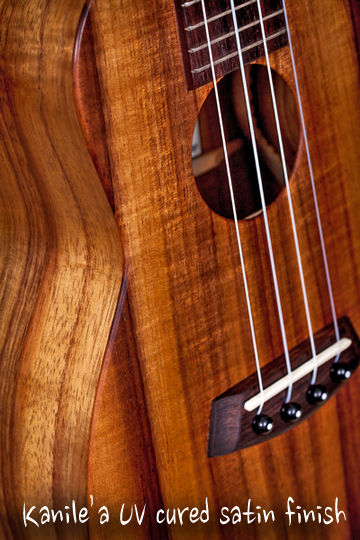 Kanile’a uses the same polyester finish formula as Taylor guitars and it has many advantages. It’s thin yet strong and looks gorgeous without ruining the tone. This finish is one of Kanile’a’s most loved features. It’s a very professional gloss. The other finish that Kanile’a has been applying is an oil base finish similiar to gun stock oil, or Tru-Oil. Actually, it’s a varnish, oil combined with resin and thinner. This finish is applied with a rag or brush. A shellac sealer coat brings out the grain as well and richness in color. So what does this mean to the player? The scientific details of a finish won’t usually help you choose one. So what’s the deal? The varnish satin finish alters the tone of the wood less. A “woody” feel is another loved feature. There is a bit less to inhibit sound, but Kanile’a is quite talented with a laquer gun and UV lights. Their gloss is thin yet strong and it lays on like a sheet of glass. It compresses the edge frequencies a touch, but it doesn’t take away from the projection, volume, or sustain.Some actually prefer the tone for it’s articulated mid range. The way it shows off some gorgeous koa doesn’t hurt. The practical advantage though, to Kanile’a’s sprayed lacquer finish is it’s protection. The regular satin finish will dent or at least scratch easier. So say I want the protection, and may even prefer the tone of their UV cured finish, but at the same time don’t like shiny, and prefer a more natural wood look? That’s where the new finish option comes in. Introducing Kanile’a’s SFUV! It’s sprayed on UV cured polyester lacquer, like their gloss, but in a satin version. Less reflective, and less likely to show smudges, but to me the biggest advantage is the feel. It doesn’t have that roughness many lacquer satin finishes have. No tacky top creating percussion where it’s not wanted. On the contrary, your hands are free to glide across the neck and body like an olympic ice skater. It’s as slippery smooth as you could possibly imagine.The new finish is labeled SFUV after the model name. It does cost the same as gloss, but some will prefer it’s look and feel. Here Corey Fujimoto samples their regular satin back to back with the new UV cured satin. They change often so watch for the switches and compare the sound.This audio is one mic unaltered in any way. No added compression or reverb. Mono dry. Hearing like your in the room requires studio monitors or high quality headphones. Computer speakers and below will compress and alter the audio character. When is Corey going to publish the “Play ‘Ukulele like Corey Fujimoto” book? I’d like to order the first copy. Gosh, so close, but I think the UV cured seemed to have a bit more articulation on single note runs. During strumming, I liked the slight increased warmth of the oil satin. Either way – a winner (and I’d order the UV cured). Now, how do they compare to the UV gloss? I use Sennheiser HD800 via Apogee Groove DAC to listen to this audio. Oil base satin finish gives more ‘colour’, high-frequencies overtones, it rings closer to crystals. UV Satin – I believe it is same as UV Semi-Gloss, and same as current “E SILK”-branded finish. I’ve read somewhere that “more compressed overtones” and yes I agree; but I disagree that it will give you “more projection”: not if everyone in orchestra uses the same Uke! I like sounds of crystals, and sounds of bells, both have its’ place.